Posted 12/29/2014 by Sarah Beth Alcabes & filed under Abortion Rights/Reproductive Issues. 2014 has been a rough year for women and feminists, to say the least. Between the Hobby Lobby decision and the results of the 2014 mid-term elections it is easy to feel discouraged. As the year wraps up, let’s look back on the good and the bad of the past year, and get ready to keep up the fight in 2015! 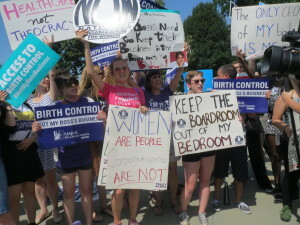 This summer, the Supreme Court released a devastating decision in the case Sebelius v. Hobby Lobby ruling that corporations may deny women reproductive health care coverage, such as contraception, on the grounds of religious beliefs. Corporations are legally allowed to deny their employees coverage for basic health care, because of religious exemptions. As NOW has always believed, religious exemptions are harmful to women. No one, other than a woman and her doctor, should be making decisions about her health care, no matter what their personal religious opinions are. In the wake of the Hobby Lobby decision, opposition to religious exemptions among many of NOW’s allies and coalition partners has strengthened. Not accepting religious exemptions as a valid excuse for discrimination is a vital step in fighting for both reproductive justice and LGBTQIA equality. We must continue demanding full equality and access to health care — no exceptions or exemptions. 2014 saw an increase in support from progressive organizations and politicians in expanding Social Security. NOW worked with partners such as the Center for Community Change and Social Security Works to show the broad support for expanding Social Security to include caregiver credit. Representative Nita Lowey (D-NY) introduced the Caregiver Credit Act into the House of Representatives, which would would create a credit that would be added to earnings to calculate the total deemed wages, which would then to be used to determine benefits. On average, caregivers spend 4.6 years removed from the labor market, which ultimately leads to serious financial burdens later in life. Since it is primarily women (about 66%) who tend to fall into these categories, this credit not only would allow them to receive higher benefits in retirement, but would help keep many older women above the poverty line. It is vital to continue this momentum into the new year and ensure that women receive due credit for their hard work. Our country has a very long way to go to achieve racial justice. The non-indictments of the white police officers that killed unarmed black men Mike Brown and Eric Garner has provoked outrage and protest among the Black community and their allies. NOW has also spoken out against the treatment of Marissa Alexander, a black woman who was prosecuted for firing warning shots in self defense. Additionally, in coalition with groups such as the African American Policy Forum (AAPF), NOW urged the White House to expand its My Brother’s Keeper initiative to include women and girls of color. Responding to the demands of AAPF and NOW, among others, the White House released a report entitled “Women and Girls of Color: Addressing Challenges and Expanding Opportunity.” Although the report left much to be desired, the fact that the White House felt the demands of inclusion warranted response is significant. NOW will continue pushing for intersectional policies and demanding that minority girls and women receive the government aid they deserve. Finally, in 2014 we have had the misfortune of witnessing blatant dismissal of the reality about violence against women. Intimate partner violence and sexual assault continue to be massive problems in our country, and despite attempts to sweep these issues under the rug, NOW has been a leader in speaking out against perpetrators and institutions that protect abusers. The most recent example of this is NOW’s #ResignGoodell campaign. By refusing to accept mediocre and half-hearted attempts to save the NFL’s reputation, NOW is demanding real change from the NFL, an organization that is exceptionally popular in American society. By calling out Goodell, demanding his resignation, and demonstrating unwavering support for victims and survivors of domestic violence, NOW is changing the conversation and slowly shifting the paradigm around responsibility for ending domestic violence and abuse. There is no doubt that this has been a difficult and discouraging year for feminist issues. But we are confident that with your support, we can achieve great success for women across the country in 2015. NOW needs your help more than ever to make these dreams a reality. We must head into 2015 ready to fight for, and win, our rights! Will you stand with us? Yes! You forgot to mention Amendment #1 in TN that passed in the mid-term election that restricts abortion and all of the churches that had signs all over their lawns to Vote YES. 2014 sucked – let’s make 2015 better!